British author Tope's two series detectives, Det. Sgt. 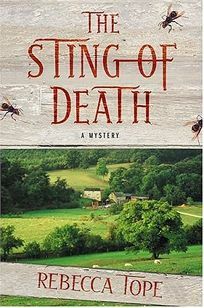 Den Cooper and amateur sleuth/""alternative undertaker"" Drew Slocombe, join forces in her fifth mystery (after 2003's A Death to Record), a dark, unsettling cozy set in rural East Devon. When Drew and his wife, Karen, entertain Karen's cousin Penn Strabinski for an afternoon, they learn that Penn has come to seek Drew's help in finding another cousin, Justine Pereira, who has gone missing. Justine had been living on what was a working farm until mad cow disease forced the slaughter of the livestock. With the help of his irreverent assistant, Maggs, and the hard-luck detective sergeant (just back from a disastrous fortnight's holiday on Corfu), Drew unravels a complex tangle of hidden secrets and murder. Readers drawn by the placid swath of green English countryside on the jacket should be prepared for a challenging plot and a host of psychologically wounded characters, including a cold and driven career woman, a devastated farmer and an unhappy housewife. A character list helps keep track of the complicated family relationships.